The process of taking a gene from one organism and inserting it into the genome of another unrelated organism to give it certain new traits is called Genetic Engineering (GE) or Genetic Modification (GM). Genes can be found in the nucleus of every cell in all living organisms and are the very building blocks of life. They decide the characteristics, structure, growth and behaviour of all organisms, including us. They play the critical role of passing on genetic information from one generation to the other. If you are tired of people telling you how you resemble your parents, you can blame genes for that. In the 1970s, some clever scientists figured out that they could transfer genes of one species into the genome of another and that got them excited. What if we were to insert spider genes into the genome of goats? May be the goat milk would contain spider web protein? What if we were to insert cow genes into the genome of pigs? May be they would develop cowhides? And that’s how the whole genetic experiment began. The most commonly grown GM crops have bacterial genes inserted into the crop plant unnaturally. 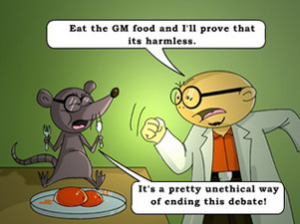 How can GM affect you? When a foreign gene is inserted in to the cell of an organism, it can disrupt the genome (gene sequence) in ways one can't predict. These unintended side-effects of genetic modification can be harmful to those who consume it, to those who grow it and also to the environment. When GM food was tested on laboratory animals by independent scientists, the results were alarming. They had stunted growth, impaired immune systems, potentially precancerous cell growth in the intestines, inflamed kidneys and lung tissue, less developed brain, enlarged livers, pancreases and intestines and higher blood sugar. In the case of GM crop cultivation (and not just consumption), it has been documented that outcrossing of the genes affects native diversity. It is also seen that there are unintended adverse impacts on non-target and often beneficial organisms. Pest resistance, pest resurgence, emergence of tolerant weeds, impacts on soil health etc., are all potential results of cultivation of GM crops. Farmers who wish to remain GM-free and even organic will have their crops contaminated due to outcrossing from neighboring GM fields, if any. The regulation for such harmful food is surprisingly lax. In US, for example, safety is the company's responsibility and their reports on studies are often not made available for public scrutiny. The food doesn't even carry a label, so the consumer has no knowledge or choice about GM. GM food crop cultivation appears to be all set to be launched in India very soon, if the Government of India has its way, and this is in the form of a Genetically Modified Mustard. What are the GMOs (Genetically Modified Organisms) introduced in India? The only genetically modified crop approved for cultivation in India is Bt cotton. As yet no GM food crops have been approved for commercialization. The apex regulatory body in the Ministry of Environment, Forests & Climate Change called GEAC (Genetic Engineering Appraisal Committee) has approved the import of GM soybean oil of a particular kind into India. Other GM oils like GM canola oil are being imported illegally into the country. Also food products packaged in, and imported from the United States which contain soybean, corn and canola would be genetically modified as it is neither labeled nor segregated in the United States. However, such imports are illegal and it is important that citizens alert the Ministry of Commerce and Department of Consumer Affairs of suspected GM foods. A Ministry of Commerce’s notification requires that all GM imports be declared so at the port of import and come in only after clearance from GEAC; the Department of Consumer Affairs’ Legal Metrology Act mandates that all GM packaged products be labeled so. What are the crops for which GM trials are happening? Field trials and research are happening on numerous food and non food crops in India. These include rice, maize, wheat, brinjal, okra, pearl millet, chick peas, potatoes, tomatoes, papayas, sugarcane, sorghum etc. In addition, the Indian biotechnology regulator had approved field trials for GM rubber trees. Also there are news reports with regard to permission for release of GM mosquitoes. As you can see, we are talking about various Genetically Modified Organisms here, and not just crop plants. How will I know if I am consuming GM foods? As per an amendment of the Legal Metrology Act implemented by the Department of Consumer Affairs, and which came into enforcement from 2013, all GM packaged products are supposed to be labeled so. However, none of these imported GMOs are being labeled or being declared at the point of entry as per the Directorate General of Foreign Trade’s regulation. In addition, Bt cotton seed oil produced within the country is being blended along with most other vegetable oils, given that almost 96% of cotton in India is Bt cotton. Therefore, almost all commercial vegetable oils in India other than organic oils have GM content. Further, packaged foods imported from GM-cultivating countries like the USA, with ingredients of corn, canola, cotton seed and soy can be suspected to be contaminated with GM. How can we be GM-free? One way that we can be GM free is being organic and consuming foods from organic famers/retailers. However, to sustain it and to ensure that GMO contamination does not spread, we have to stop the environmental release of GMOs. The current attempt to introduce GM mustard would lead to the spread of the genetically modified genes into other mustard varieties. Therefore, all of us have to speak up and ensure that policy level intervention is brought in to keep our food, farming and environment GM-free.